Communication for residents of Denville, NJ. Former Denville Councilman Gene Fitzpatrick has been selected as County College of Morris’ Outstanding Alumnus of the Year by the CCM Alumni Foundation. He will be honored in a charity fundraising gala May 4th at the Hanover Marriott. Fitzpatrick graduated Denville’s Morris Catholic High School in Denville and chose to attend County College of Morris. 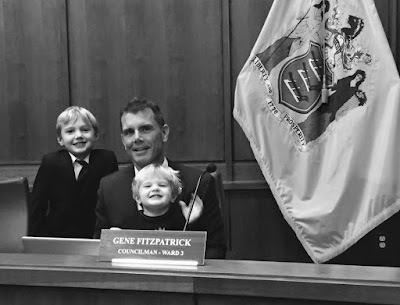 “I was lacking direction despite the good high school education” claims Fitzpatrick. CCM helped him explore different topics and courses to pursue his educational and career path. After graduating CCM in 1992, Gene transferred to the University of Maryland where he would further refine the communication and marketing skills he first developed at CCM. 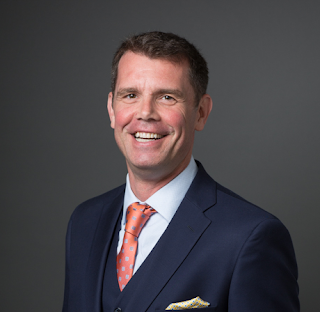 From there Fitzpatrick has gone on to great success as a marketing executive and community leader. Gene has helped steer digital marketing campaigns for many consumer and pharmaceutical brands. He currently is an SVP at Grey Healthcare Group, part of WPP’s Health and Wellness division which is one of the largest advertising agency networks in the world. He has also helped lead several other adverting agencies into the digital world and was a pioneer in social media co-producing one of the first podcasts, Hometown Tales. He credits his work at CCM’s radio station (WCCM) for developing his broadcast production skills. 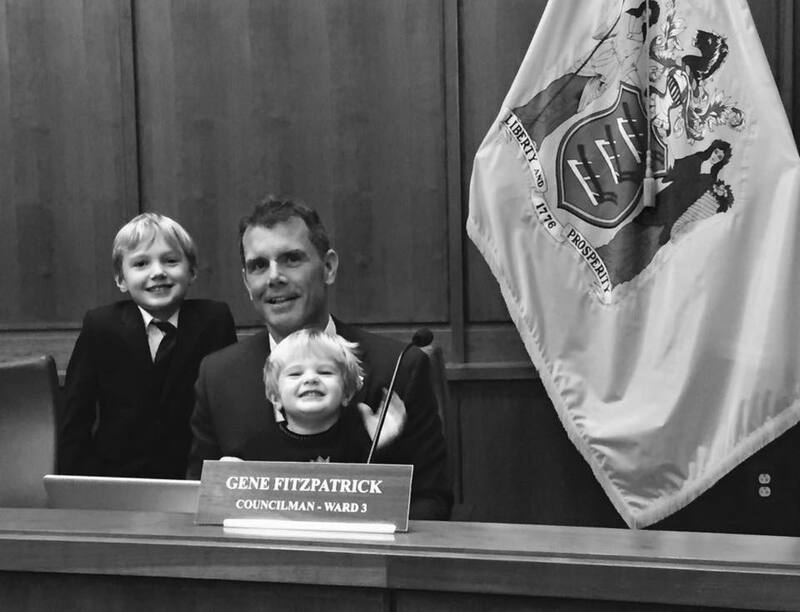 Fitzpatrick served on Denville’s Town Council for 8 years and was also selected as Council President during Denville’s centennial year. During his service, Gene helped lead many rebuilding efforts resulting in the damage left from Hurricane Irene. Choosing not to seek re-election last year, Fitzpatrick still remains locally active as a board member for Downtown Denville’s Business Improvement District & The Foundation of Denville as well as additionally volunteering for other causes. His wife Wendy and 2 young boys are also part of that volunteering. There are so many accomplishment to be proud of from the last 8 years. However, these are the successes of many authors - Various Council Members, the Mayor, His administration, the previous Mayor, his administration, professionals and volunteers. Most importantly they are accomplishments are of a community. Property maintenance and environmental protections. Ordinances that help things like the Farmer’s Market succeed. Some of the lowest municipal budgets and tax impacts in decades. Outstanding Township employees that have been hired like the Administrator, our Township Clerk and Deputy Clerk. Most amazing of the many successes, The way a community came together to rebound from the devastation of Hurricane Irene. The professionals, the responders, the Council and the Mayor-elect at the time were the right people in place. Denville had the right leadership and more importantly the unbelievable strength of our residents to rise above the water and rebuild stronger than ever. There are two other resources that are products of the outstanding foundation Denville provides. Two accomplishments in progress that I am most thankful for and proud of. They are in the audience this evening. One is 7 years old, Quintin and the other is 2, Zaeger. My sons who are benefiting from the greatest town to raise a family in, Denville. For all their lives they have shared a good amount of their Father’s free time with Denville. Often 3 nights a week Dad was not able to read that bedtime story or join them for family dinner. Their mom, and my wife Wendy, I also thank for being able to wrangle these 2 outstanding maniacs to bed at night alone and supporting me through 8 years. I believe it was worth it if we were able to keep one less drop of water from flooding our neighborhood, or that kept one more firetruck on our streets, or filled a downtown building with a store to enhance the experience of the best downtown in the county, or helped the best police department in the state stay well equipped and staffed. While their success is still a work in progress they are joined by many others. The other children of our firefighters, school volunteers, social services workers, other council members (and future ones) and the countless volunteers that help beautify, protect and energize Denville. They are have been infected with a beautiful contagious virus than runs rampant in this town: The contagion of volunteerism. The spirit has taught us, and teaches them a simple truth in life; As individuals we need certain things to survive, food, water and shelter but most importantly…we need each other. We need a community of people that can tackle challenges stronger together than alone. These two little accomplishments, God-willing in making, will be the product of this outstanding community —A result of Denville. Tonight is my last night in this chair, at this dais, the last time to contribute to tough decision making but I am still excited, invigorated & proud to know this is just the beginning of a long run at still being very much part of this great community. Thank you Denville for allowing me to represent you the last 8 years, The pleasure and honor has been all mine. However, specific to the Casterline development, there are some flyers and a website (Ironically entitled the ‘Naked Truth’ which is leaving out A LOT of information ). In response, I want to try and clarify why we are in the situation we are in. I believe by the time the Council will actually vote for the rezoning change in the area to provide for the development I will have already left office; however, it’s important for residents to know the issue. I have offered to speak with this group several times but have not been invited. I will try again and sign up for their newsletter. Again, I am hopefully a reasonable solution can be found but I warn residents to be careful what we ask for. Some of the suggestions by this group will most likely lead to massive and costly litigation for Denville as well as even more higher density development that Denville would have no say or influence in. That risk is too great. I caution residents to question the credibility of someone passing our flyers to you at Acme the same way you’d question Denville’s Council. The Council has no vested stake in approving developments. The Council gains nothing from entertaining this issue except that we have to try and make the best decisions for the whole town and in doing so protect our town. For years Denville had done its part to provide affordable housing through our township. We have always obliged to the various different formulas that have been provided/changed/revised by the state. We actually enter the current round with a slight surplus of affordable housing credits. 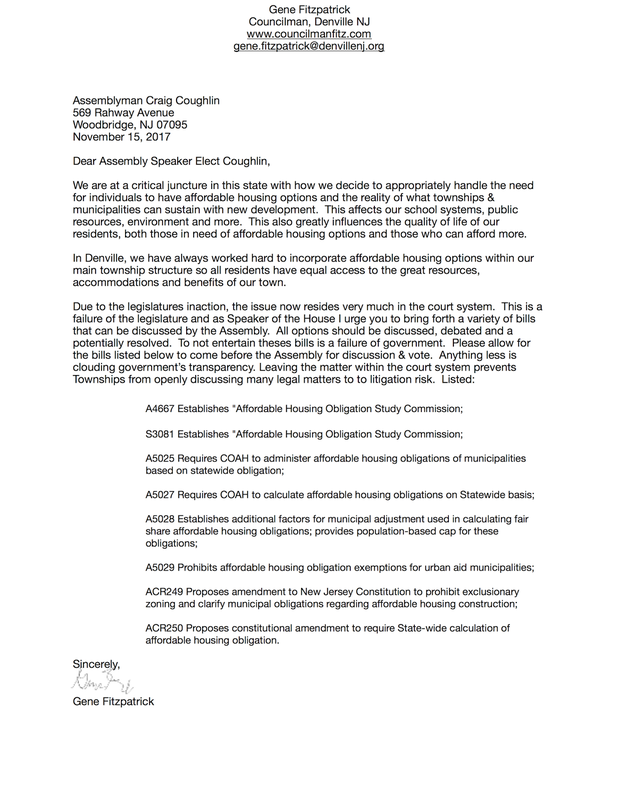 The Fair Share Housing Center, a lobbying group and our adversary in the courts has proposed that NJ need many more affordable housing options a specifically nearly 1500 in Denville (which actually would mean 6000 total homes added in Denville, if you include the market rate units in that calculation. That’s double the town’s current housing). 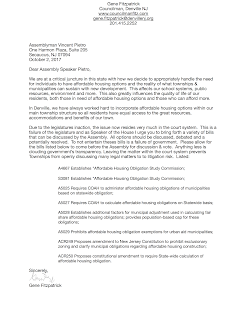 With that, Denville and other municipalities resorted to court because the State legislature was unable to approve and develop appropriate guidelines for assigning an affordable housing obligation for each municipality. Last year, the court asked Denville to submit a proposal based upon calculations performed by our expert on how many new affordable housing units we were obligated for and how we would propose to accommodate the construction of these units. Since several other developers are part of that lawsuit, Denville had to provide solutions that would show some reasonable attempt at working with these interveners. Unfortunately, since it was a court matter, the governing body could not open those discussions to the public. The Council and Planning Board supported some potential ways to accommodate the developers, knowing that they were theoretical. Now, we are trying to determine and negotiate the best way to allow for responsible and smart development in various areas. Nobody is disputing that. Unfortunately, the courts have continuously ruled that they are not interested in how affordable housing affects those resources. Sad, but true. Therefore, we are unable to use the impact it will have on our school system or other resources as a defense. WHY NOT TELL THE DEVELOPERS “NO”? Several developers have joined the Fair Share Housing Center, positioning themselves as part of the “solution” to develop the quantity of homes the FSHC is asking for. In the past developer’s often would file builders remedy lawsuits which accused municipalities of unconstitutionally preventing them for being able to construct affordable housing. These lawsuits not only cost municipalities millions to dollars in court fees but almost always resulted in larger, higher density developments where the municipality was completely removed from the planning process. As well the courts in NJ have almost always sided with those developers. A way to avoid those lawsuits is to abide by the courts process and continue to “move forward” with a working path to smart development. This is what Denville has done. The moment Denville says “no” to a builder/develop, it is almost guaranteed that a developer would claim Denville to not being compliant in this path forward. If the court agreed, Denville would lose ALL immunity to the Builder Remedy lawsuit. 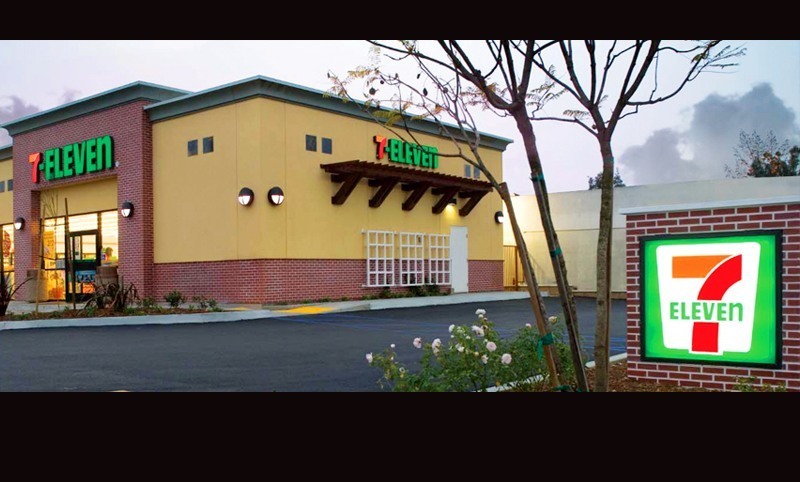 That means, ALL OF THE OTHER DEVELOPERS SEEKING HOUSING PROJECTS IN TOWN WOULD FOLLOW SUIT. That could cost Denville MILLIONS OF DOLLARS IN LEGALS FEES and RESULT IN MASSIVE DEVELOPMENT. Many times more that what we are entertaining now. WHY DOESN’T DENVILLE BUILD A GIANT AFFORDABLE HOUSING COMPLEX TO FILL ALL THE AFFORDABLE HOUSING CRITERIA? 1. A developer needs to be interested in that. Despite this nonsensical system, it is still a free market. I’m not a fan of townships building housing, that’s for the private sector. No developer has showed interested in that yet. Other municipalities who have constructed 100% affordable developments have had to pay for them with tax payer monies at an average for $225,000 to $250,000 per unit (Public Entities are required to pay prevailing wages). 2. Let’s call it what is is, that’s a “project” with all the connotations intended. The point of affordable housing is to give people of different economic statues the opportunities and resources of a preparing community. We’ve done a great job assimilating affordable housing, I don’t think we should be building 1 massive complex for just affordable housing. Those who need affordable housing should share the same access and resources as others. A great example of that is the development on Old Boonton road and the smaller one on Church Street. 3. It’s extremely costly. Some people will say that it’s less than the cost it will cause our schools, roads, etc… but I disagree and don’t think a municipality should front a cost like that. That’s millions of dollars. It’s irresponsible. My opinion. 4. Developers would still sue. At this point even if the township had planned some lagging housing project, the intervener developers with other housing developments would still sue and potentially have a good case against us. Their projects are shovel ready and would provide housing within a year or 2 vs. the several years and large cost hurdles to build a development. HOW ABOUT SENIOR HOUSING/VETERAN HOUSING, ETC? There are maximum caps for Senior Housing and we’ve already reached our quota for those types of housing requirements and it would not satisfy any of our current affordable housing requirements. Not yet. The developer originally was looking for around 230 units. The Mayor and administration have been working to hopefully negotiate, revise, plan for something considerably less. The last presentation from the developer was showing around 65 units with a number of 3 bedrooms. That was very concerning but I am really hopeful that when it comes back to the council, there will be a more promising proposal. Most likely, it will be after I am out of office though. There is a very active volunteer group that is extremely against anything being developed there. I applaud their activism and hear them. However, I’d be very cautious to a solution that denies that developer from building a small property. As stated before, that would result immediately in costly lawsuits and MASSIVE development throughout all of town. REMEMBER: Townships have not won those lawsuits in NJ. Not one that I know of. 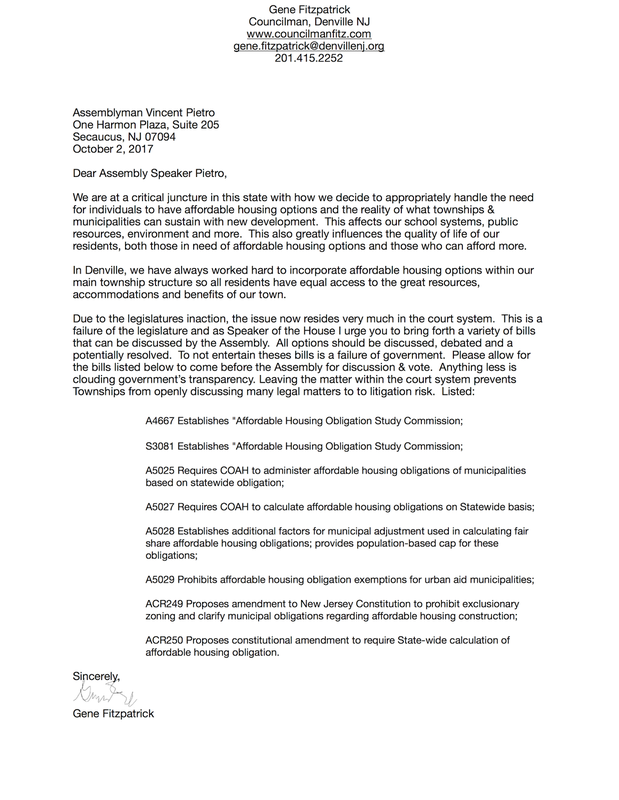 WHY DOESN’T DENVILLE HAVE A COMMUNITY HOUSING COMMISSION TO HELP? In the past, all of those matters were shared with our planning board, environmental boards, etc… A group of volunteers to help this current situations will probably not do too much now but if there are more threats ahead, it is something to consider. That would be the prerogative of the Mayor and Administration. Probably not that simple. Voting it completely down, I can almost guarantee will result in the developer claiming Denville is not complying which would make Denville lose immunity to all developer lawsuits. Some people say “We shouldn’t back down and we should fight”. That’s a nice thought but in the history of this issue I don’t know of any municipality that has won. So we’d end up spending millions on legal fees and end up with more housing then we are currently trying to settle on. Those risks are far too costly. That’s been my approach. I’m curious to see what the Mayor and Administration can work out. Most likely some development on Casterline and the other areas but less than would result if we lost immunity from builders remedy. Many have been doing this and I think this is our only hope. There is no way local elected officials are going to risk their town being overdeveloped as a result of court rulings. But if the legislature shows some sign of taking the issue back and come up with guidelines for affordable housing, it could entice local officials to be rejecting settlements too soon. Here are a list of several assembly bills that should be debated in the NJ Assembly. Write current Speaker of the Assembly Vincent Pietro and incoming Speaker, Craig Coughlin and ask them to enable open debate on this pieces of legislation. 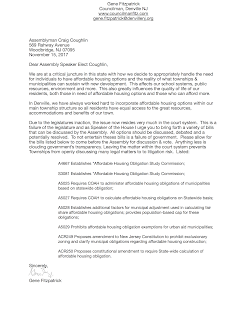 ACR250 Proposes constitutional amendment to require State-wide calculation of affordable housing obligation. We are at a critical juncture in this state with how we decide to appropriately handle the need for individuals to have affordable housing options and the reality of what townships & municipalities can sustain with new development. This affects our school systems, public resources, environment and more. This also greatly influences the quality of life of our residents, both those in need of affordable housing options and those who can afford more. In Denville, we have always worked hard to incorporate affordable housing options within our main township structure so all residents have equal access to the great resources, accommodations and benefits of our town. I couldn't imagine who would ever want to be New Jersey's next governor. Our state is in such a terrible mess -enormous property taxes, insane state school funding formulas, a State pension fund so deep in the hole that 3 former governors at a League of Municipalities Conference recently agreed they wouldn't even know where to being in order to fix it. However, I'm very impressed with a candidate who has a plan and gives real answers to question vs. the same older political rhetoric. That candidate is Jack Ciattarelli, he's a businessman and resident first, before politics. 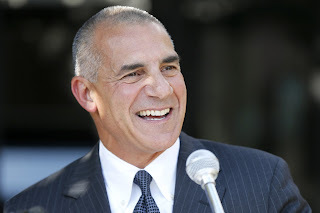 I've never been one to shy away from disagreeing with my own political party but I believe Jack Ciattarelli is the best person to lead the state. The Primary selection for Governor should not be a coronation of an establishment's candidate that automatically assumes the nomination. It should be a contest and debate. In those debates Jack has demonstrated himself to be the better candidate. Here are the reasons why I'm supporting Jack Ciattarelli in the June 6th primary. SCHOOL FUNDING - Finally someone is admitting why our property taxes are so out of control and has a plan to fix it. The way the State funds our schools is all out of wack. Jack is pointing this out and vowing to change that formula. He acknowledges it will take bipartisan work in the legislature but already knows which Democratic Assemblypersons and Senators are open to support it. There is no reason why residents of Denville should be paying leagues more money for their schools than affluent property owners in Hoboken or Jersey City. We need a new fair funding formula. TERM LIMTED - I enthusiastically applaud how Jack has term-limited himself in every political position he's had. He believes politicians must NOT be a permanent part of a political machine. Jack is a business owner and resident first. He is not tied to a political establishment. BENEFITS REFORM - I point blank asked Jack how'd he accomplish this with a Legislature that is in the pockets of big unions. He has a plan. Jack knows he can lead support for school funding reform with key bipartisan support in suburban counties. Once that success is achieved he can leverage that equity for State benefits reform. All the stakeholders have to come together instead of the mudslinging and name-calling that has been happening for the last 8 years. It's time for a new and fair approach on both sides of the issue. AFFORDABLE HOUSING - It's a simple plan, get it out of the courts and back to the legislature. As Governor, Jack will appoint a fair council that will be committed to getting something done instead of being deadlocked in political stalemate. I'm proud of my political party but we need to put the state first over political parties and work across the aisle. THE DMV - Finally a NJ political figure is pointing out how inefficient the DMV is and wants to fix it. HE CAN WIN IN NOVEMBER- NJ voters lean heavy Democrat and the actions of this last administration and the National Republican Party over the last few years have nearly destroyed the party in NJ. Jack is putting NJ first and is the only one who has smart sound ideas that both Republicans and Democrats can agree with. We need to fix the the states finances ASAP and there is a way to do it without massive tax increases. Let's fix the wasteful inefficient state government. Ciattarreli's opponent Kim Gaudagno is a nice individual. I am grateful for the support she has shown Denville, but it's time for change. The accusations against Jack from her campaign are wrong. He is not looking to raise taxes, instead he is actually giving voters an honest and complete plan about how he will fix this economically dying state. I much rather a candidate that gives details instead of quick marketing tricks and sound bytes. Vote Jack Ciattarelli June 6th. He's a really impressive guy and the only hope we have to save NJ. 7-11 is intersted in purchasing the old auto-garage across from Norman Dean Funeral Home in Denville. I'm not a huge fan of 7-11s and not too interested in one being so close to our downtown. It has the potential to disrupt the small-town feel Denville has. However, the area has been zoned for commercial/retail use for decades. 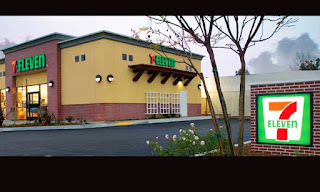 And the owner of the property has a right to sell/open whatever type of establishment he/she wants as long as fits with the type of usage area has been zoned for. And despite my pre-conceived notions of what 7-11s look like, there are some newer 7-11s that are very presentable and work well within downtown districts. Morristown & Panther Valley are two examples. I might also note that outside of being illegal, restricting an establishment from opening due to unsubstantiated stigmas of that establishment would easily result in costing Denville taxpayers tens of thousands of dollars. Naturally any property owner would sue the Township if we restricted them, which is unbelievable costly to taxpayers. The Planning Board can request the applicant (7-11) make remedies to accommodate parking, traffic, etc.. but can't say "no we don't want a 7-11". It can also be an opportunity to ask the 7-11 owners to do other things to help the neighborhood. (They wouldn't be contingent on approval but it doesn't hurt to ask) So I encourage everyone who is concerned about those implications to attend the meeting and ask questions during the public portion. The Planning Board is made up of fellow Denville residents just like ourselves. None of them have any vested interest or benefit in whether a 7-11 is there or not. I have confidence they'll make the right decisions for our town and I encourage residents to discuss these matters with the Planning Board. If you absolutely don't want a 7-11? Let's utilize the best form of protest we have, our wallets and pocketbooks. Show up to the meeting and remind 7-11 that we'll support SmartWorld or Mara's for our coffee. We'll go to DenvilleMart for quick convenience items. When we need a newspaper, we'll go to the Smoke Shop. Contact 7-11 Corporate. and let them know as well.